N ONE OF the cities of Galilee where Jesus was teaching the people a Pharisee named Simon came to hear him. Like many of the other Pharisees, Simon tried to find fault with Jesus. Because he could neither see nor hear anything to criticize in Jesus, he decided to ask this teacher to take dinner at his house. There he would watch him closely, and possibly find something that would be wrong. So Simon the Pharisee asked Jesus to come to his house one day, and Jesus went with him. Other people went, too, some who were invited and some who were not. And they all came into the dining-hall where the food was placed on the table. Around this table the guests were given room, while the uninvited persons stood back, looking on. Looking about, she espied Jesus, and at once she hurried to kneel at his feet. Then she wept tears of sorrow for her many sins, and the tears fell upon Jesus' feet. She dried his feet with her hair, and kissed them. 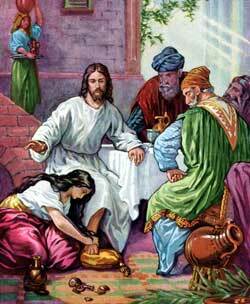 Afterwards she broke a beautiful box of costly perfume and anointed his feet by pouring the perfume upon them. Simon, the Pharisee, knew this woman; for she was a great sinner. He had heard many things about her that were not good. He was surprised when he saw that Jesus allowed her to weep at his feet and to anoint them with sweet perfume. He said in his heart, "If Jesus were a prophet he would not allow this woman to come near him. He would know that she is a wretched sinner, unfit to be in his presence." Jesus knew all about this sinful woman, and he also knew about Simon's thoughts. He looked at the proud Pharisee and said, "Simon, I have something to tell you." "There was a certain rich man who had loaned money to the poor men. The first man he loaned a great sum of money, and the second man he loaned only a small amount. When the time came to repay the loan, neither of the two men could pay back the money they had borrowed. In their distress they came to the rich man, and he freely forgave them both. Which of these two men love the rich man the more?" "I suppose," answered Simon, "that the man whom he forgave the bigger debt loved him the more." "You have answered rightly," said Jesus. Then he turned to the sinful woman still weeping at his feet, and said, "Simon, when I came into your home you did not treat me like an honored guest. You did not give me water to wash the dust from my feet; but this woman has washed my feet with her tears and had dried them with the hair of her head. You did not give me a kiss of welcome; but this woman has kissed my feet. You did not anoint my head with oil, as you anoint the heads of your friends who come as guests into your home; but this woman has poured costly ointment upon my feet. Wherefore I tell you that her sins, which were many, are forgiven; for she has loved much. But those love little who have little forgiven them."